These days we are all glued to our electronics, cell phones, televisions, video games, fitness watches, tablets, and more. More and more we are becoming virtually connected and less actually connected. This is especially the case for our children who are part of the generation known as “digital natives.” Now don’t get me wrong, I ‘m not anti-electronics; I live on mine as much as anyone. However, I am about electronics in moderation and quality time with our children in abundance. Like anything in life, technology is about balance and it’s important for us and our children to understand how to make and nurture relationships without the intervention of electronics. Here are four ways to spend quality time with your kids without electronics. 1.) Eat Dinner Together: Eating dinner together or at least one meal per day together creates the opportunity to talk to one another. During the meal make sure electronics are banned for everyone. Focus on the conversation, ask questions and answer the questions your children ask you. Meal-time conversation is one of the best ways to find out about your child’s day and to keep the connection going. 2.) Do Something Active : Our collective attention spans are getting shorter, which means a good way to engage with your child is by doing something “active.” By active, I mean something that requires movement. For example, I often exercise at home and my kids “help” me by joining in. We stretch, do crunches, squats and more together because they love to watch me struggle and I love to have their company. In the end, we both get a work out in, have some laughs, and make some memories. Other examples of active things you can do are go outside and play catch, go bike riding, take a walk, go on a hike, create a scavenger hunt for them that requires them to move, or go in the backyard to play or to a nearby park. 3.) Work on a Project Together: Depending upon the age of your child, the project can vary from putting together a jigsaw puzzle to having them help you paint a room. Find something age appropriate and engaging. Spending time together engrossed in a project is the perfect opportunity to have conversation and spend quality time together. Listen to your child’s favorite music while you do the project if it isn’t disruptive and introduce them to music you love. With my kids, for example, we have put together puzzles, built marble mazes, done science experiments, planted and took care of a garden. 4.) Have a Family Night: Set aside time for a family night and make it a tradition. 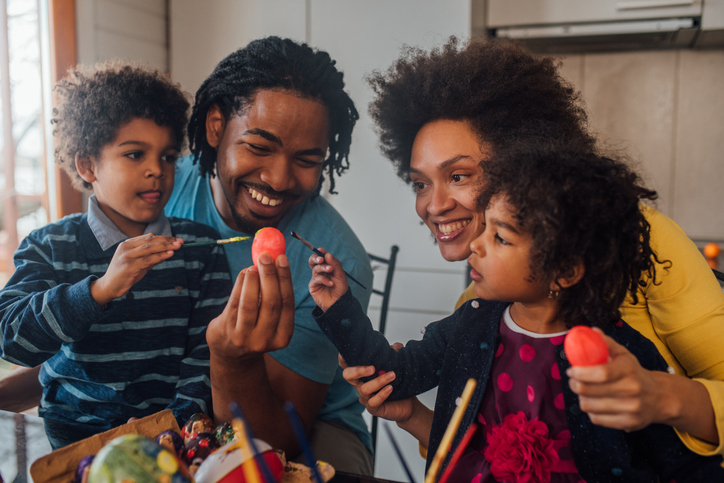 Whether you watch a movie, play board games, go out to dinner, or take in a show, make sure the entire family is involved and make sure you do it consistently. Spending time together as a family, without electronics, is important towards building quality relationships with your children. The key to all of this is making real connections in real time. We are all busy, so don’t focus on how much time you spend together, focus on the quality of the time you do get to spend together. No matter what you do, remember to turn the electronics off.